A small oasis of luxury: the ideal place to escape from the chaotic reality and devote themselves to relaxation and intimacy: it guarantees an exclusive and certainly romantic holiday. 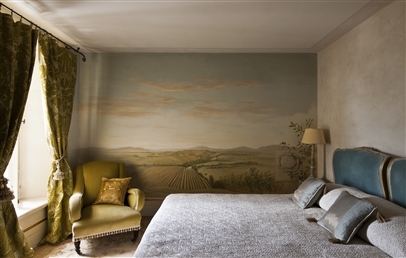 The Relais Borgo Santo Pietro overlooks the enchanting Serena valley, lying on the green hills of Siena, a short walk away from the picturesque village of Palazzetto. Its position is also favourable for guests interested in art and culture, who can choose whether to visit Siena, just 35 minutes away from here or Florence, just an hour’s drive. Nearby there are also the famous wineries of Chianti and Montalcino, that have made the Italian wines famous all over the world, as well as the San Galgano Abbey, a 1.5 km trek and home of the “Sword in the Stone” legend. 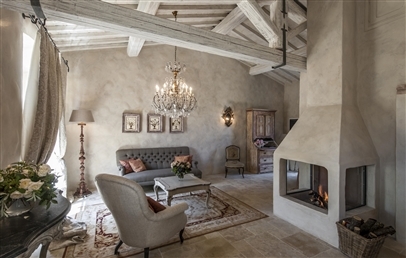 The villa Borgo Santo Pietro is the result of the passionate project of its Danish owners, Claus and Jeanette Thottrup, always in love with Italy and the green hills of Maremma. The property is a villa of the thirteenth century, formerly used as a refuge for monks and travellers on pilgrimage that from England and across Europe were directed to Rome. The renovation has maintained the original characteristics of a country house built in stone and enriched with fine details. The grandeur of the building is harmonized by the surrounding gardens which stretch over 5 acres of parkland, where nothing is left to chance, because it has been carefully studied by the garden designer Valstad Helle in collaboration with Jeanette. This has been in fact divided into sections by following the Italian gardens style. Particularly fascinating are the beautiful rose garden in front of the rooms, the avenue of cypresses that winds around the park and the section in which herbs and biological products are grown. The owners of the hotel, inspired by the new concept of hospitality, are used to pamper their guests with care and sympathy. The high quality service of the hotel Borgo Santo Pietro is strictly personalised, and gives the traveller the feeling of familiar atmosphere. It is the ideal place for a romantic holiday and a place where it is easy to experience the ties with Mother Earth. 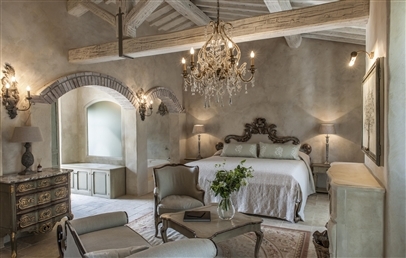 The Borgo Santo Pietro has 20 rooms including nice Suites furnished with refined elegance and attention to detail, in a style that reminds us the Baroque, morover two magnificent Pool House Suites with approx. 85 sq.m. 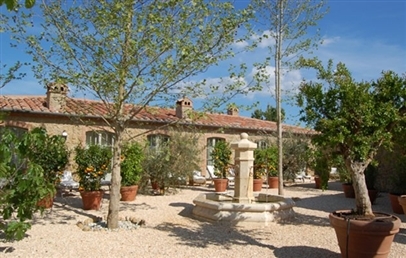 surface with own private pool and two beautiful Suites with private garden. 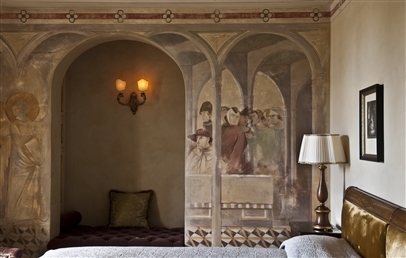 Each is embellished with antiques, silks, tapestries, magnificent beds and frescoes. Each includes a living room where to relax and are also equipped with a fireplace (except for the Deluxe rooms) that can be lit on request. All accommodations are equipped not only with the most modern comforts, but also with some high-tech options such as touch screen lighting, TV with LCD screen and a docking station for the iPad, fully loaded iPad with a selection of music, a DVD library and with Borgo's own concierge app. This exclusive spa welcomes harmoniously their guests to immerse themselves in the scents of medicinal herb gardens in the countryside of the Borgo Santo Pietro estate. The spa was built with natural local stone and features the four elements of nature. There are two rooms for individual treatments inside and also on the outdoor. Guests can enjoy various holistic therapies, including the Ayurvedic Shirodhara treatment and organic therapies with the luxurious collection of the "heaven" products dedicated to skin care. Moreover to enhance the wellbeing of body and mind are several classic and relaxing treatments offered. 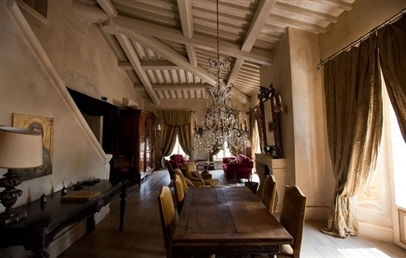 The Borgo Santo Pietro houses two restaurants open both for lunch and dinner. 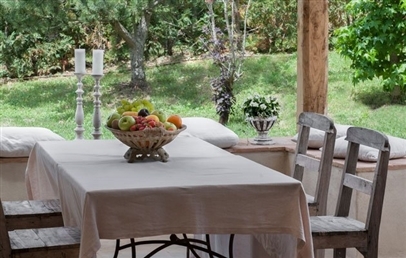 Meo Modo is the Michelin-starred gourmet restaurant while the Trattoria offers a typical Tuscan cuisine. An open kitchen, Victorian-style, in which it is served an informal breakfast, where the chefs of Borgo Santo Pietro are at guest's disposal and ready to meet their individual needs. For those who would rather eat a light lunch, we recommend the poolside bar, from which to enjoy the magnificent scenery of the Serena Valley. The chefs combine the recipes of the Italian cuisine with a careful attention to detail which gives it an international touch, using the herbs and the biological products that are grown in the park of the villa. Their renowned wine cellar provides a select range of excellent Tuscan and international wines. Particularly appreciated at Borgo San Pietro is the evening aperitif in front of the fireplace in the central hall or at the pool bar. You can enjoy a prosecco (sparkling wine) listening to the piano bar music, a collective ritual that involves everyone in the house, helping to create a very harmonious familiar atmosphere. Moreover, in the old guest house now used as a health club, it is possible to have holistic spa treatments that will give a lift to your physical, mental and emotional well-being. Children's playground; baby-sitting on request and against payment. The Borgo Santo Pietro offers its guests the possibility to use the tennis court, a basketball court and to play bowls. Every year in the hotel various events are organized in order to involve the guests in recreational activities or sports of high interest. Among these activities, the cooking classes at the Borgo Cooking School are very successful because people have the opportunity to learn, from great chefs, the secrets of Tuscan cuisine. The production of pecorino cheese in the Resort's dairy. Another interesting initiative is the organization of an exclusive dinner with renowned Italian sommeliers who give valuable tips on how to match wines with dishes. Refined and intimate bedrooms with double bed or twin beds, private bathroom with bathtub. View over the garden. 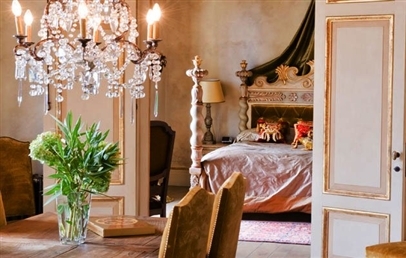 Charming double room with amazing flowers frescoes. 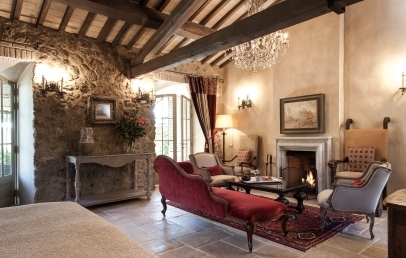 Among its rich furnishings it includes an antique bed, a mahogany desk, a Gobelin golden couch from the XVIII century and a beautiful stone fireplace. The private bathroom has a sink console, mahogany mirror and separate shower with stone floor of the recovery. 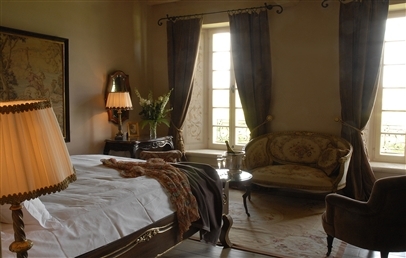 Superior rooms overlook the landscaped flower garden surrounding the Villa. 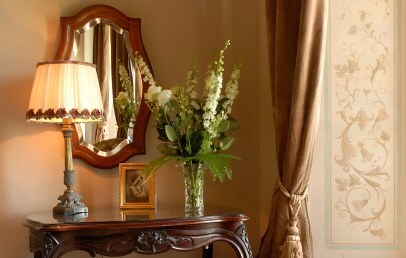 Luxurious suites, furnished with refined elegance and a special care for every detail, in a Baroque style. 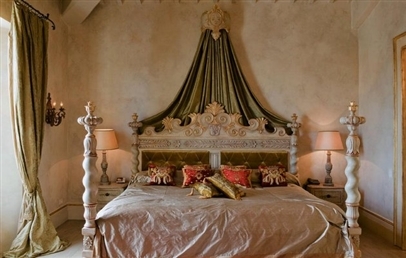 They are enriched by antiques, silks, tapestries, magnificent beds, frescoes and crystal chandeliers. The bright gold color creates a fascinating contrast with the blue or with the black. 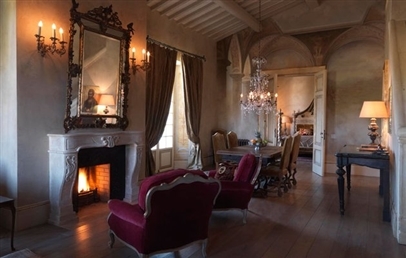 The suites have a living room with fireplace, chairs or armchairs of the XVIII Century. 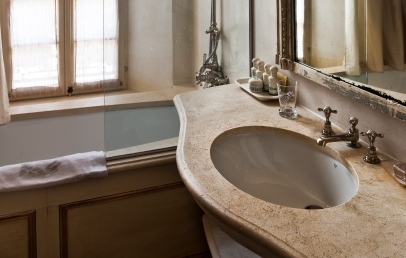 The private bathroom is covered in marble and equipped with bath tub and shower. The Suites have large windows overlooking the garden. 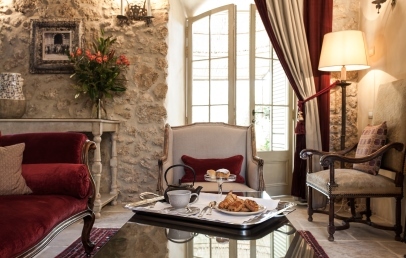 These suites can be interconnected, on request and subject to availability, with the Garden Suite Basilico and Garden Suite Maggiorana. Elegant and refined bedroom which opens into the Mediterranean courtyard, with fragrant lemon and citrus trees, sun lounges and table to relax surrounded by nature. Great attention to detail , fireplace, private bathroom with tub. Prestigious Suite with king-size bed, it is the most exclusive Suite of the hotel and is located in a private and secluded area. Living room with private balcony and stunning views over Valle Serena. 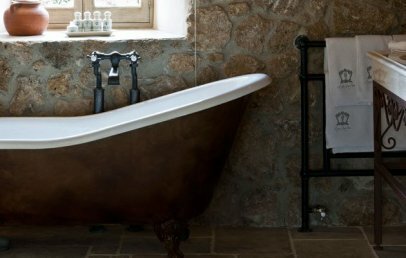 Refined bathroom with a freestanding bathtub, two pedestal sinks and a separate Roman style shower. Private 100 sqm panoramic terrace. 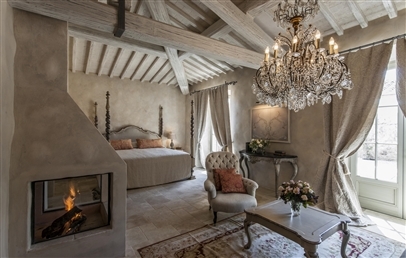 Elegant Suite furnished with precious fabrics, crystal-drop chandeliers, Casa dell’Unicorno is located not far from the main villa but in a quiet position. It opens onto a private Mediterranean garden and has a private terrace; refined bathroom with huge free-standing bathtub. 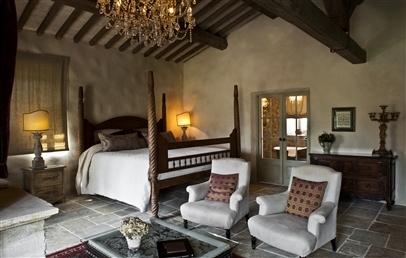 Comfortable and rustically Suite with oak beams, stone floors and mahogany four poster bed. 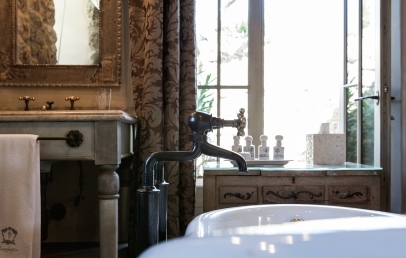 The crystal chandelier offers soft light over the Suite until the bathroom with the free standing bathtub. 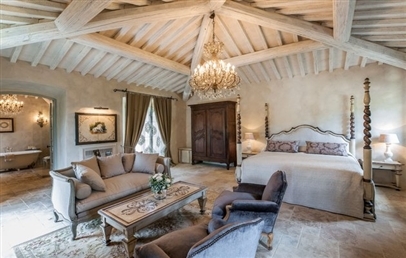 This suite can be interconnected, on request and subject to availability, with the Garden Suite Rosmarino. 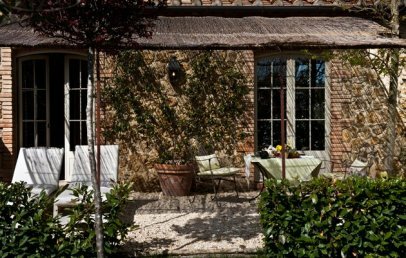 The Garden Suite Maggiorana is located away from the main villa of the Borgo in a peaceful environment and enveloped by crafted gardens. 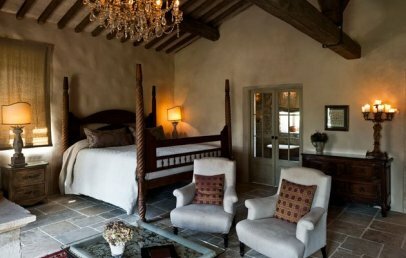 A nice and spacious Suite with a private garden, with oak beams, stone floors and a crystal chandelier. The Suite has a night area and a day area with a fireplace. The bathroom offers a bathtub and a separate walk-in shower. 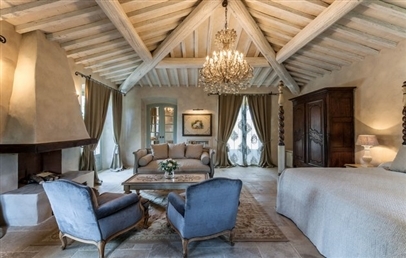 On request this Garden Suite Basilico can be connected with the Suite Rosmarino, perfect for a stay of a numerous family. Only for Charming customers: Fruit, flowers and Prosecco upon arrival!